Slowly but surely, I'm finding great staple pieces to inject back into my wardrobe... like this simple black cami from Staple that I'm trying very very hard not to mentally outfit plan for everything. It earns so many bonus points though with all its spaghetti strap glory and the fact that I swear it's made out of magical fabric, because it straightened itself out this week after becoming a crinkled mess on the journey home from the store. This will definitely be a go-to for dressing up and down. 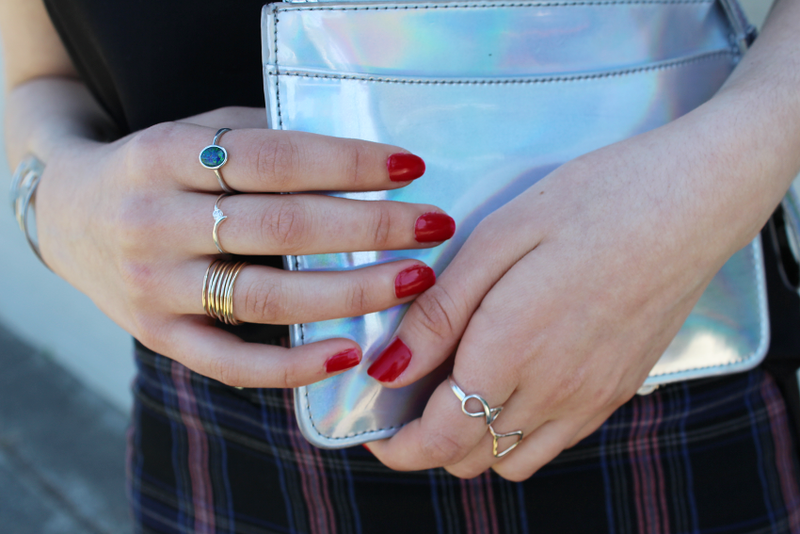 Your silver clutch is eye catching! Love the strappy top and your plaid skirt is stunning. You look great! What a cute skirt! I love plaid. Love the way you have styled this, a gorgeous, chic outfit! Looove this look! Nice pics! I didn't want it to be too much of a 'plunging' top haha but I think that strap is well-placed! My auntie gave them to me (brand new) after a wedding so SCORE!